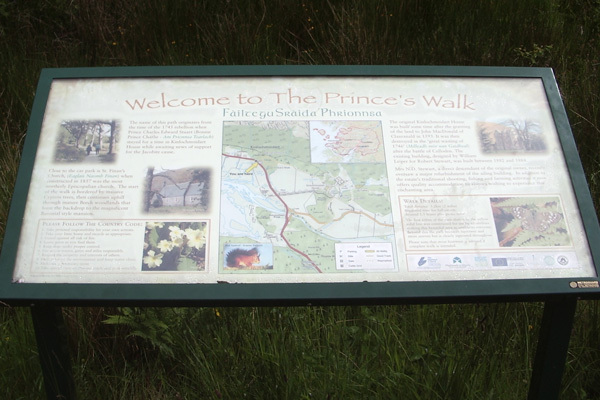 The Prince's Walk is an interesting circular walk through the grounds of Kinlochmoidart estate and woodlands (marked red on the map). The walk is named after the association of the original house with the 1745 uprising in support of Princes Charles. The route passes through oak and beech woodland, with a few small steep ascents and descents, skirts along a lawn and walled garden and along the rhododendron-lined Mackenzie’s Walk, before heading back along the wooded banks of the River Moidart. The path is a little indistinct in places, but marked by yellow arrows, usually on post and tree trunks. It is a very pleasant, easy going walk, affording good views of Kinlochmoidart House built in the nineteenth century (1884) (the original was destroyed after the Battle of Culloden), the surrounding hills and crags, and Glen Moidart. Look out for the many fine exotic specimen trees (including Cryptomeria japonica, Abies spp, Picea spp and Chamaecyparis spp), along the route and in the grounds of the estate. A real treat for the dendrologist. Look out for eagles on the crags surrounding the estate, as well as a range of woodland birds. The short stretch by the River Moidart is particularly pleasant and a good place to see dippers and otters (if you are lucky). There are some oak trees strewn with epiphytes on route. 1. The walk starts from the car park at St Finan’s Church at Kinlochmoidart, just off the A861. There are two interpretation boards detailing the history, geology and wildlife of the area. Take the track by the interpretation board and follow the way marker signs. The route takes you on a gravelled track through the grounds of Kinlochmoidart House. At the end of the path, just before you reach the lawned area in front of the house, take a sharp left turn and ascend steeply up a small hill. The path zigzags up the hill through oak and beech woodland following the yellow way marker arrows, turning first right and then left, before descending to cross a small stream. 2. Once across the stream, cross the stile and descend by the fence line to a walled garden. Cross a small wooden bridge and walk by the bottom of the walled garden. This is a lovely section of the walk, particularly beautiful when the blue irises are in bloom in summer. 3. Cross the next stile into an open lawned area with a pond. Follow the edge of the lawn passing in front of a metal deer target and then onto the pond. There are good views of the crags, fringed with Atlantic oak woodland and birch above. 4. Near the pond, cross the small stream on your left using the stepping stones and follow the fence line up the hill, as directed by the signpost. The route passes through beech woodland with some fine specimen trees. Once at the top, descend towards the road by gradually traversing the hill, heading downwards towards a small wooden bridge across a stream. 5. At the road, turn right to head towards a junction by some holiday cottages. Turn left and follow the MacKenzie Walk. 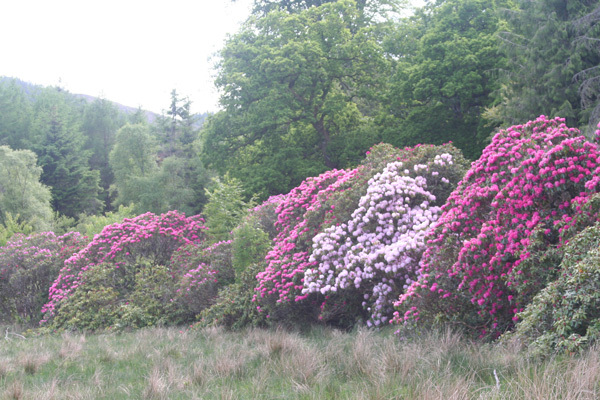 This rhododendron-lined Mackenzie’s Walk is particularly lovely when in bloom in May/June. 6. At the end of the MacKenzie Walk, turn right and then immediately left at the junction with road, and head through a gate on the far side to join the banks of the River Moidart, as directed by the arrows. The path now skirts the banks of the tree-lined River Moidart, with open rough pasture on the right. This section is particularly enjoyable, and there are some interesting specimen trees on route. Look out for dippers, sandpipers and otters on the river, fieldfare and red wing on the rough pasture (in winter) and golden eagle soaring high in the surrounding crags in summer. 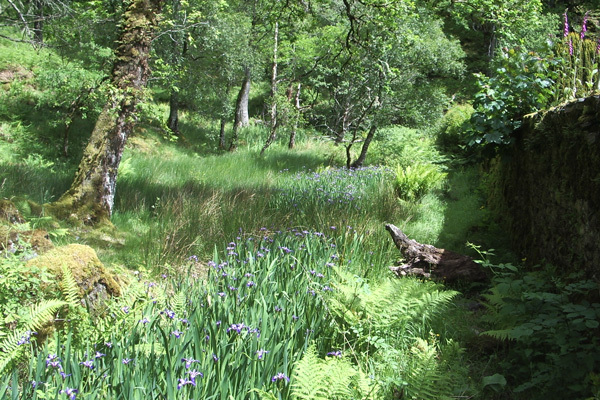 The trees along the banks of the River Moidart support a range of woodland birds. This section is also a good place to see red deer. 7. On exiting the metal kissing gate at the bridge, continue to the main road (A861) and turn right along the road for a short distance back to the car park. The road affords good views of Loch Moidart and the crags. Another easier walking option is The River Moidart Walk, an enchanting walk by the banks of the River Moidart and along the Glenmoidart road with fine views of crags and river. Park at Kinlochmoidart and walk along the Glenmoidart road until you reach the fish farm (Kinlochmoidart Hatchery). Look out for golden eagle soaring over the crags, and redwing, fieldfare and greylag geese in the rough pasture (seasonal). Once near the fish farm, head towards the river passing through the metal kissing gate just before and on the right of the wooden bridge to the fish farm. Continue along the footpath along the banks of the River Moidart. This is a lovely section of the walk. Look out for common sandpiper and dipper by the water's edge and for otter in the nursery pool by a picnic bench. 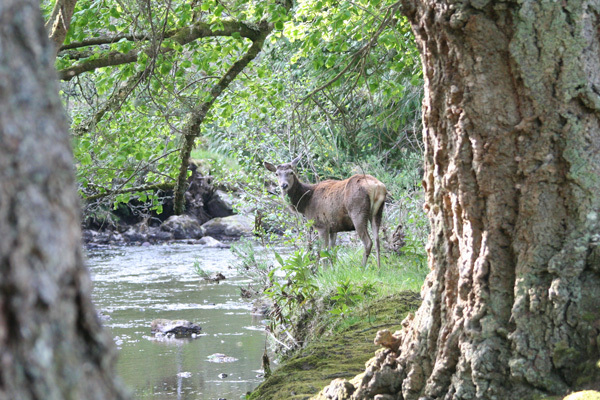 It is also a good place to see red deer. There are some fine specimen trees of route. On exiting the metal kissing gate at the bridge, return to your car. The Isles of Glencoe Hotel & Leisure Centre nestles on the shores of Loch Leven a short distance from Ballachulish and the village of Glencoe. The hotel offers some 59 rooms and has a leisure centre with a swimming pool on site. There are a number of walks nearby including the Brecklet Trail and The Glencoe Lochans. There are also a number of operators nearby offering boat trips on Loch Leven.